Music festivals can be such a blast, especially in the summer! You’re surrounded by other people who are all there for the same reason as you – to have a good time with some good music and some laid back party people! But we’re all about optimizing fun, since we each only have one life to live. So how do you make an already fun music festival even better? 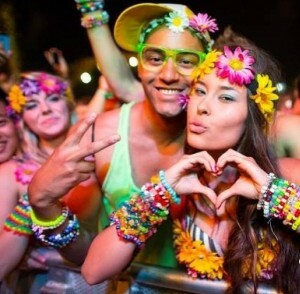 You become the standout king or queen of the festival! Everyone will be dressed to impress with their cutest outfits, prettiest dresses, and sharpest shirts, so the best way to stand out is to go crazy. Confidence is incredibly attractive to both genders, whether it’s for friends or more, so the best way to get a big group of people around is to project confidence! Rocking crazy, over-the-top look does just that.You’ll want to start with a fun outfit, or even a costume. For the guys, dressing up as a favorite character or animal is an instant conversation starter, perfect for chatting up even the prettiest of the girls. For the girls, a sparkling rave bra or sequin top paired with a crazy pair of pants or an enormous dancer’s skirt can be fun and cute at the same time. But whatever you wear, do not think you’re done once you have the clothing figured out. Accessories are essential to take your look over the top! Rock an awesome hat to make you taller than the crowd, so you’ll stick out even in aerial shots and have those photos to remember the festival by forever. Rock a colorful wig to grab attention and change up your look. Go for something really out of the ordinary, like an enormous spiky rockstar wig or a rainbow unicorn wig! Continuing along with the colors theme, colored contacts (prescription or not!) can be your best friend to make your face more visually interesting. You can get striped colored contacts, neon colored contacts, or even white-out contacts for a really trippy effect. Big earrings, sparkling bling, and clip ons for exciting temporary piercings on your lips, nose, upper ear, etc. can be really fun! Big bracelets extra pep to your outfit. Win! Whatever you choose to wear to your next music festival, don’t forget to go big and you’ll see the fun multiply before your eyes! There is plenty of time to be normal and boring, but party time is decidedly not that time. Have a blast letting out your inner wild child!